How do you pay for your online slots? Do you whip out the debit card, find that old credit card you’d thought you’d made a jigsaw for the kids out of, or perhaps you rely on third-party processors like Neteller, Skrill and Ucash. Soon we could well be talking about the latest suite of online and online and mobile slots that accept Bitcoin as a valid payment method. With the news that a dedicated mobile slot – BetCoin Reels – has been launched that accepts the digital currency, Bitcoin, how likely is it that this form of currency will be the payment method of choice for slots players in the coming years? Imagine loading up your online casino account with gold (not literally – that could get a little messy), a commodity that’s worth a dollar amount and that can rise and fall with the markets. That’s what Bitcoin offers its users. A digital currency conceived by a mysterious programmer known only as “Satoshi”, Bitcoins are “mined” on computer servers with the use of a complicated algorithm, and users can then purchase a Bitcoin – worth a fluctuating amount day-to-day – or fractions of one on special Internet exchanges. The difference between Bitcoin and a classic commodity like oil is that Bitcoin is finite. The amount of Bitcoin “mined” will run out in about 2140. Therefore, the value of the currency looks set to increase over the years, although rivals – such as LiteCoin – are appearing all the time. With the virtual currency finite, it means the value of Bitcoin can rise as well as fall depending on how trading affects it. The value of a Bitcoin rose to $980 at its peak in 2014. But has dropped dramatically in 2015 to £235 at the time of writing (February 2015).These dramatic fluctuations in value make has put many people off using it, however some Bitcoin users still continue to use it despite the volatility. Bitcoin can be used at many online – and offline – merchants, to buy CDs, clothes, and other Bitcoins, with the lack of fees involved attractive to many small businesses looking to avoid credit card business fees once and for all. Bitcoin came to mainstream attention when the Silk Road website was set up, openly selling Class A drugs to the public and accepting Bitcoin as a valid payment method. The site was shut down, and its owner sent down for years, but it’s in the world of online gambling the currency – particularly in a regulation-free USA – looks likely to be most accepted. The anonymity and freedom from traditional bank fees are attractive to online gamblers who want to keep their details from prying eyes and want a hassle-free transaction when depositing to an online gaming site. There are problems, of course. Firstly, the volatility of the price of Bitcoin may scare gamblers off who want to know exactly how much they have to withdraw from their online casino accounts. Sure, winning $200 on online slots is great, but when you come to withdraw that in Bitcoins and discover your bankroll is worth only $50, that doesn’t seem so great. Meanwhile, US lawmakers still jittery about widespread online gambling legislation may baulk at allowing a currency to be used at online gambling sites that has been linked so much with money-laundering and crime (not to mention cases of viruses that turn unsuspecting computers into Bitcoin mining slaves. Some sites are already experiencing problems, with some coming under scrutiny from the authorities. 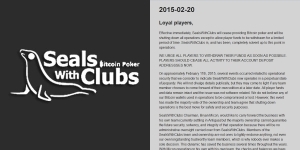 For example, the Bitcoin poker site Seals with Clubs has literally shut its doors with immediate effect and encouraged players to withdraw any bitcoin they deposited immediately. Many believe that it was pressures from the DoJ that ended their operation. Others are just blatently shady, using cloned software and ripping off competitor sites, something that always leaves me with an uncomfortable feeling. Despite the fears, some online gambling rooms are using Bitcoin right now. Since UIGEA and Black Friday, when traditional payment methods in the US became impossible, some sites turned to Bitcoin as a method of payment for its US customers. Some online casinos offering slots and roulette trade solely in Bitcoin, as do many US-facing poker sites frozen out post-Black Friday, and there are many Internet gambling sites like SatoshiDice – named after Bitcoin’s mysterious inventor – which trades and pays out in Bitcoin. Betcoin Reels is surely the tip of the iceberg. The major casino online players are treading warily for now, but if we wait until Bitcoin’s price settles over the next 12 months, and cases of fraud diminish, we could see it being accepted more widely. Meanwhile, Bitcoin rivals are beginning to appear all the time, so it’s fair to say that digital currencies – keen to distance themselves from the excessive fees of traditional currencies – aren’t going away anytime soon. For a pastime that celebrates anonymity, online casinos and slots may prove to be the perfect bedfellow for Bitcoin. However, we recommend you look into your chosen casino before depositing with Bitcoin. Check that they have a valid operator license – ideally from a trustworthy jurisdiction.